Super Typhoon Nepartak hit Taiwan on July 8 and was the strongest one in the century. It brought widespread damage to homes in Taitung. The most vulnerable and disadvantaged children and families should be the first priority to assist and most of people were very concerned about the needs and protection of children in affected areas. With the devastating impact of Super Typhoon Nepartak, Taiwan Fund for Children and Families (TFCF) has launched the emergency response to reach the assisted households immediately. TFCF has provided affected children and families with NT$1,000,000 in total as the emergency relief fund. All social workers in TFCF Taitung Branch visited assisted households and provided affected families emotional support and encouragement. More than 220 TFCF assisted households and 500 children were mostly affected and their lives were destroyed by Super Typhoon Nepartak. TFCF has issued an emergency appeal to help reconstruct sustainable livelihoods and rebuild their homes in Taitung immediately. TFCF disaster recovery plan has been divided into two phases from one to two years because it may take a long time for the relief and reconstruction work. Mr. Li-Min Chao, chairman of the Taiwan Fund for Children and Families, visited Taitung and saw the destruction site caused by Nepartak. Mr. Chao committed immediate and forceful actions for disaster relief and announced the recovery plan in order to help children and families resume their lives as soon as possible. At the first phase of Taitung recovery plan, TFCF has provided the emergency relief funds up to NT$10,000 (US$311) per household to affected families and proposed the budget plan of NT$21 million for Taitung recovery project, including rebuilding houses/communities and subsidizing agricultural damages. 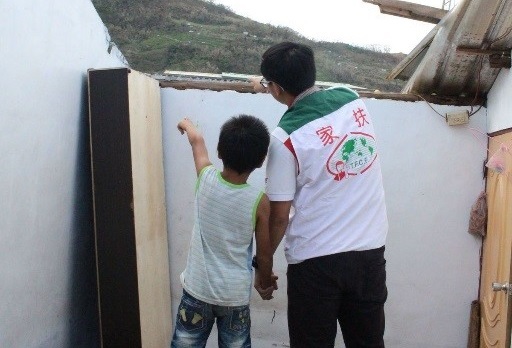 TFCF social workers will monitor, inspect and regulate the post-disaster needs and well-being for needy children and families at the second phase of Taitung recovery plan. Meanwhile, TFCF Taitung Branch Office has collaborated with churches, schools, and local organizations to assist school-age children care and mental health needs during this school summer vocation and help families overcome this tragedy with support. TFCF has launched fund-raising activities and an emergency appeal for donations to help reconstruct sustainable livelihoods and rebuild homes for vulnerable and disadvantaged children and families in Taitung after Super Typhoon Nepartak.